Toss out modern minimalist just this once, and go all out “18th century French” for your bridal shower! Visualize the extravagant look of that era and bring it to this special occasion—from your party venue, to its ceiling decor, to your table display, all the way to your guest keepsakes. Sounds intimidating? Don’t despair. While Marie Antoinette was certainly known for her excesses and opulence, the creative use of materials can allow you to experience her private boudoir with less effort than you think. Gather six to eight of your dearest friends and prepare for a luxuriously romantic tea party! 1. 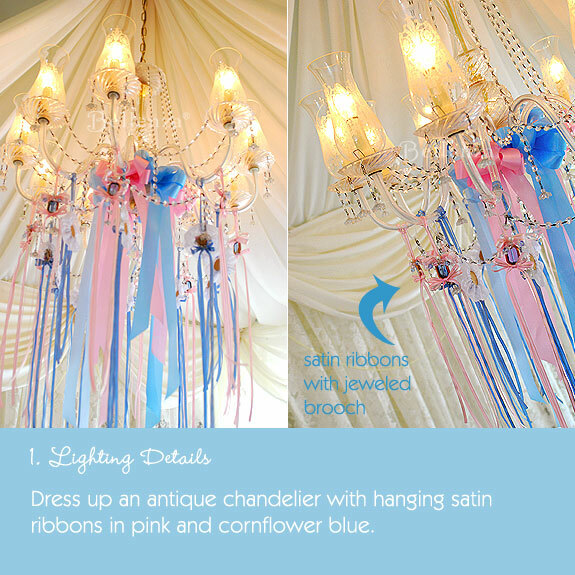 Antique glass chandelier – Found a venue with a lavish, antique chandelier? Then, you’re truly lucky! Take advantage of this stunning piece and tie it in to the shower’s color scheme with varying widths and lengths of hanging satin ribbons in cornflower blue and pink—with each bearing a lovely blue jeweled brooch. 3. Topiary-style centerpieces – Recreate the lavish ambiance of the French court with towering centerpieces. 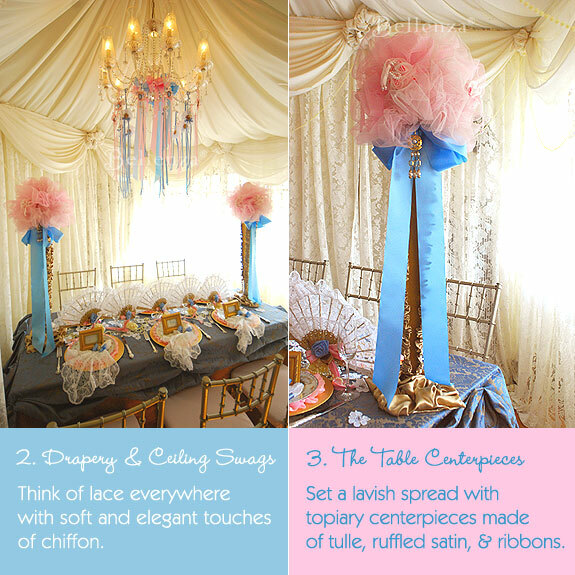 Cover tapered stands in ruched bronze-colored satin and—for a topiary effect—top each with a fluffy ball of pink tulle finished with an oversized blue satin bow. 4. 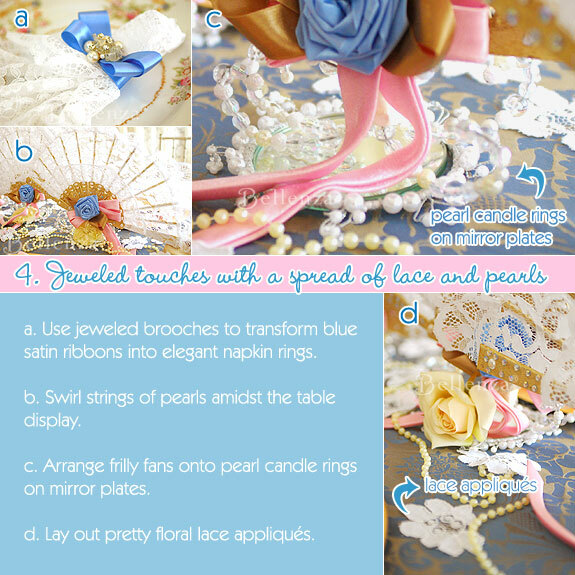 Jeweled touches – Swirl strings of pearls amidst the table display, arrange frilly fans onto pearl trimmed accessories, lay out pretty floral lace appliqués, and use jeweled brooches to transform blue satin ribbons into elegant napkin rings. In a final gesture of “queenly generosity,” you may even surprise your guests and include these brooches as keepsakes of your shower. 5. 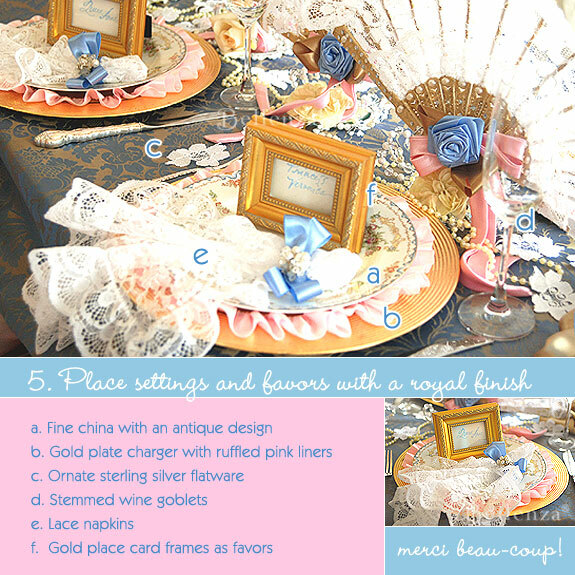 Place settings and favors fit for a queen – Establish the rich look of the table display with a gold-and-blue brocade tablecloth. Then, for truly royal place settings, set out fine china plates, gold plate chargers with ruffled pink liners, ornate sterling silver flatware, and stemmed wine goblets, with frilly white lace napkins as the ultimate finishing touch. Looks very detailed indeed , but very doable too! The pictures are gorgeous! 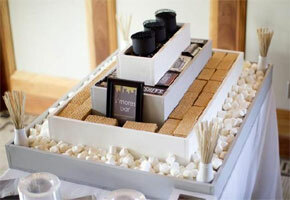 This would be great for a bridal shower tea party. You feel like you’re in another place with this theme. LIke the cornflower blue ribbons. I’m looking to buy some cornflower blue ribbon for my newphews wedding could you hellp with where to go? Be sure to check out stores such as Jo-Anne Fabrics, Hobby Lobby, Walmart, or even Michael’s. You can also check out online stores such as Paper Mart. Hope this helps! And you may want to bring a swatch if possible so you can match it more precisely. Good luck! 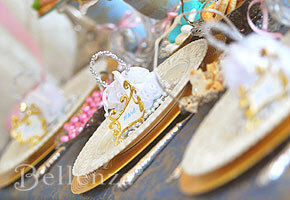 I am having a Marie Antoinette style wedding…where did you find the fans? Can someone please tell me what this china pattern/design is? It is just gorgeous! The blues, pink flowers and gold accents. Just beautiful! The brand name of tea cups is Aiyo China, Made in Occupied Japan. You might be able to find them under antique china on sites like ebay. will you guys publish a tutorial for the topiary centerpiece???? 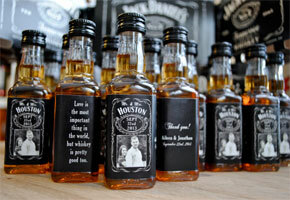 i really want to make that. Hi, Gillian! A full-blown DIY article on that topiary centerpiece has yet to be published. But here’s a link to an article we did on various topiary ideas (this tulle one included). And it does include a basic list of materials and procedure that will hopefully be of help! But if you need more specific inputs, please do email us at bellenzabistro@gmail.com and we’ll be happy to answer your questions. Where do find the pink ruffle liners? Love them!! This is a gorgeous table!! Thanks, Stacy! 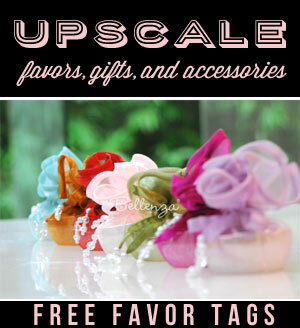 Actually, those ruffle liners can be DIY-ed. Just take wide pink satin ribbon (3″ wide would be good) and run a needle and thread through one edge. Then, pull the thread so that the ribbon ruffles up and cut it at a length to just fit underneath the rim of your plates. Secure it in a “wreath” shape with a few more stitches, and you’re done! So sweet of you, Margarita! We enjoyed that Marie Antoinette post on your blog, too. Isn’t that style just so amazingly flamboyant?! Just saw this Marie Antoinette-inspired cake and had to share it with you! Where can I buy all this? I’m trying to find the lace napkins you used online but I’m having trouble. Can you help? Actually, our stylist for this set used lace handkerchiefs instead of real napkins. You can find similar ones in the ladies’ accessories section of a department store…no need to go authentic vintage. Hope this helps! So glad you like it, Samantha! Truly a setting fit for a queen!